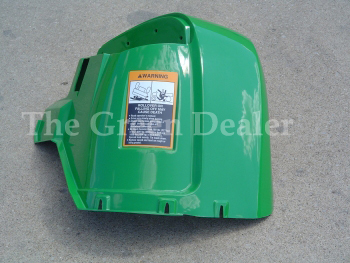 John Deere Gator 4X2 & 6X4 RH (Passenger Side) Fender. This fender comes with the cuation decal on it. This Fender is a genuine John Deere part and is new. If you have any questions or comments call us toll free at 1-888-473-6357. The exact part needed. Easy to use web site, quick shipment. Always a little leery making a first time purchase from a company over the internet. I had zero reason to worry with this company. The order, purchase and receipt of the product went smooth and easy. The product, a very overly expensive OEM John Deere part, was less expensive than through any other company I could find. My experience with this company was very good. Part looks and fits great.